This chair fuses classic European design with simple rustic charm. 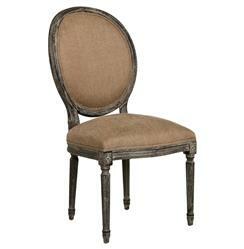 A limed charcoal oak finish adds an antique touch to this Louis XVI style Medallion side chair. Upholstered in a copper linen, this traditional oval back chair lends elegance to a dining room, sitting area or library.